The 14th Street Tunnel shutdown, also known as the L train shutdown and the Canarsie Tunnel reconstruction, is the proposed partial closure and reconstruction of the New York City Subway's 14th Street Tunnel that will occur from April 2019 to mid-2020. The tunnel carries the BMT Canarsie Line (serving the L train) under the East River in New York City, connecting the boroughs of Brooklyn and Manhattan, and is used by an average of 225,000 passengers per weekday. A key segment of the 14th Street Tunnel, between the Bedford Avenue station in Brooklyn and the First Avenue station in Manhattan, would be partially closed for 15 to 20 months to allow for necessary and extensive repairs to the underwater tubes after it was flooded and severely damaged during Hurricane Sandy in 2012. Two options were proposed in 2016: a three-year construction period where one tube at a time would be closed or an 18-month closure where both tubes would be worked on simultaneously. The Metropolitan Transportation Authority ultimately chose the 18-month closure option because it would be less disruptive to passenger service. The shutdown period was later reduced to 15 months to reduce service disruption. To accommodate displaced passengers, new or expanded bus, subway, and ferry service will be added. The shutdown plan has been criticized by riders who use the L train and people living along or near 14th Street in Manhattan, as it would have adverse effects on other subway routes and on vehicular traffic. However, in January 2019, it was announced that the shutdown would not be a full-time closure, but a night and weekend closure. 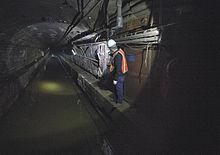 In October 2012, Hurricane Sandy caused severe damage to New York City, and many subway tunnels were inundated with floodwater. The subway opened with limited service two days after the storm and was running at 80 percent capacity within five days; however, some infrastructure needed years of repair. A year after the storm, a spokesman for the Metropolitan Transportation Authority (MTA), which operates the New York City Subway, said that Hurricane Sandy "was unprecedented in terms of the amount of damage that we were seeing throughout the system." The storm flooded nine of the system's 14 underwater tunnels, many subway lines and yards, and completely destroyed a portion of the IND Rockaway Line (A train) in Queens, as well as much of the South Ferry terminal at Manhattan's southern tip. Reconstruction required many weekend closures on several lines and long-term closures on the Greenpoint Tunnel (G train), Montague Street Tunnel (R train), Rockaway Line, and the South Ferry station. A long-term closure was planned for the 14th Street Tunnel because it was significantly damaged by the storm surge. Moreover, the 14th Street Tunnel dates from 1924; thus its equipment was already 88 years old when Hurricane Sandy occurred. In January 2016, the Canarsie Line between Bedford Avenue in Brooklyn and Eighth Avenue in Manhattan was proposed for either of two shutdown options. One option involved shuttering the entire segment for eighteen months. The other option would allow the MTA to operate two segments of track for three years: a single-track segment between Bedford and Eighth Avenues with a capacity of 5 trains per hour per direction, and regular service between Lorimer Street and Rockaway Parkway. For both options, the Third Avenue station would be closed and new exits and elevators at the First Avenue and Bedford Avenue stations would be added. The renovations would cost between $800 million and $1 billion; as of July 2018[update], the project budget includes $926 million. :13 During the shutdown, workers would replace damaged communications, power and signal wires, third rails and tracks, duct banks, pump rooms, circuit breaker houses, tunnel lighting, concrete lining, and fire protection systems. Three new electric substations would provide more power to run more trains during rush hours. The closure would affect the 225,000 subway riders per weekday who travel on the 14th Street Tunnel between Brooklyn and Manhattan. This accounts for about 75% of the 300,000 riders per day who use the L train. Community meetings were held to determine which of the two options would be better. In an internal assessment, the MTA concluded that four out of five L train riders would be less impacted by the full-closure option compared to the partial-closure option. :13 Additionally, the single-track option would result in severe overcrowding at First and Bedford Avenues. :12 A subsequent poll conducted by transit-advocacy group Riders Alliance revealed that 77 percent of L train riders preferred the 18-month closure option. In July 2016, it was announced that the MTA had chosen the 18-month full closure option. Riders reacted with both disappointment over the closure, and relief that the service disruption would be shorter. The New York Post described the closure with the headline, "2019 is the year Williamsburg dies." Colored thick lines represent alternate routes to the L train across the East River and in Manhattan. Solid black lines represent route segments indirectly affected by the implementation of alternate route patterns. Thin gray lines represent route segments unaffected by the shutdown. The segment of the L train that will remain open is represented by a thick, solid gray line. The segment of the L train to be temporarily closed is represented by a thick, dashed gray line. The MTA indicated that during the shutdown, the L route would only have a frequency of ten trains per hour between Bedford Avenue and Rockaway Parkway, because of severely constrained terminal capacity at Bedford Avenue. :12 In mid-2016, the MTA devised preliminary mitigation plans. It proposed additional shuttle bus, ferry, and subway service, extending G trains from four cars to eight, and running the M to Midtown Manhattan daily. A ferry route between Williamsburg and East Village, Manhattan, would be instituted; the M14A and M14D buses might be converted to Select Bus Service; and dedicated bus lanes would be placed on crosstown corridors in Manhattan. The MTA would institute two out-of-system subway transfers, free if paid via MetroCard: one between Broadway (G train) and Lorimer Street (J and ​M trains), and one between Livonia Avenue (L train) and Junius Street (3 train). Preliminary documents also proposed that the four toll-free East River bridges between Manhattan and Long Island (the Queensboro, Williamsburg, Manhattan, and Brooklyn Bridges) might gain a high-occupancy vehicle (HOV) restriction of at least three passengers per vehicle during rush hours. In December 2017, the MTA and the New York City Department of Transportation released a more concrete mitigation plan, based on projections that 80% of riders would transfer to other subway services to get to Manhattan, while 15% would use buses. An HOV restriction on the Williamsburg Bridge during rush hours would allow it to accommodate three SBS routes between Brooklyn and Manhattan. Route L1 would stretch from Union Square, Manhattan, to the Grand Street station in Brooklyn; L2 would connect SoHo, Manhattan to the Grand Street station; and L3 would go from SoHo to Bedford Avenue. In addition, 14th Street between Third and Ninth Avenues would be converted into a bus-only corridor during rush hours to accommodate an SBS route across 14th Street, connecting to a ferry route at Stuyvesant Cove Park near 23rd Street. The mitigation plan also entailed improvements to six subway stations, new entrances at two stations, enlarged crosswalks near these subway stations, longer G and C trains, three free out-of-system transfers,[a] increased service on the G, J/Z and M, and a weekend extension of the M train to 96th Street and Second Avenue. Finally, the plan included an expansion of New York City's privately-operated bike share system, Citi Bike, as well as upgrades to bike lanes on Brooklyn's Grand Street and a pair of crosstown bike lanes on 12th and 13th Streets. Some subway entrances on each of the affected routes would also be reopened. On December 14, 2017, members of the New York City Council held a hearing in which they asked the MTA head and NYCDOT Commissioner over the shutdown. The central question was whether the MTA could complete repairs by the July 2020 deadline. It was projected that during the shutdown, the 14th Street buses would become the most-used bus corridor in the city, and that 70 buses in each direction would travel across the Williamsburg Bridge every hour. As a result, Lower Manhattan politicians worried that the narrow streets in the area would not be able to accommodate the high-capacity buses. 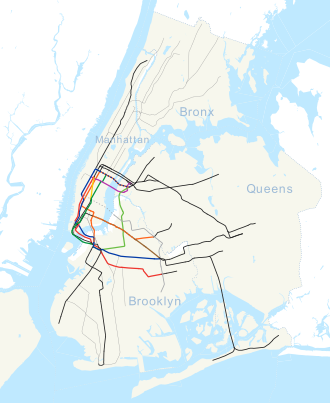 Separately, the MTA revised contingency plans so that there would be four SBS routes. They included the already-planned L1 Union Square–Grand Street, L2 SoHo–Grand Street, and L3 SoHo–Bedford Avenue routes, as well as a new route L4 between Union Square and Bedford Avenue. The four routes combined would carry 17% of displaced L train riders, while subways would carry another 70% and other transport methods would make up the remaining 13%. Citi Bike announced plans to add 1,250 bikes and 2,500 bike-share docks during the shutdown. A private company also announced their intention to create a luxury "New L" shuttle van service during the shutdown. In September 2018, the MTA indicated that the New York City Economic Development Corporation would manage the temporary L shuttle ferry's operation, since the NYCEDC already operates ferry routes in New York City under the NYC Ferry label. In turn, the NYCEDC would contract the temporary shuttle ferry's operation out to NY Waterway as per the results of a request for proposals. :261–262 The ferry would operate for 15 months during the shutdown. The shuttle will operate every 10 to 15 minutes from 6 a.m. until midnight on weekday nights, and until 2 a.m. on weekend nights. During rush hours, ferries would run every ​7 1⁄2 minutes. Free transfers will be available between the ferry and two Select Bus Service routes, one on either side of the East River. :32 The same month, it was announced that an additional bus route, L5, would operate rush hours between Canarsie Pier and Crown Heights, connecting Canarsie residents to the Crown Heights–Utica Avenue station on the 2, ​3, ​4, and ​5 trains. Unlike the other temporary routes, the L5 will not be a Select Bus Service route, and will only operate during rush hours every 20 minutes. It will start at Canarsie Pier and make a limited number of existing B42 stops on Rockaway Parkway south of Flatlands Avenue in both directions, one stop on Flatlands Avenue at Remsen Avenue, then continue without stopping until its terminal at Utica Avenue. That October, the MTA clarified its proposed temporary changes to subway service. During weekdays, there would be major increases in the number of G and M train trips; smaller increases in E, F, and J/Z train trips; minor modifications to A and R train trips; and a sharp decrease in L train trips. All of these routes except for the A and R would also see modified service frequencies on weekends, and the M would run to 96th Street/Second Avenue during both late nights and weekends. It was also announced that the shutdown would start on April 27, 2019. In the months before the long-term closure began, service would be suspended on some weekends and nights. Will operate during rush hours only. Will operate at all times. Will operate at all times except late nights. Will operate late nights only, when the M14 SBS is not operating. In April and May 2018, writers for the now-defunct Village Voice had published a comprehensive analysis of possible effect of the L train shutdown on other subway routes. The J/Z and M would be affected the most because these would be the only direct subway routes from Williamsburg and Bushwick to Manhattan during the shutdown. The G would also carry displaced L train riders from Williamsburg and Bushwick to other subway routes in Downtown Brooklyn and Queens, resulting in capacity decreases on F train riders on the IND Culver Line in southern Brooklyn. The A and ​C trains would carry L train riders transferring at Broadway Junction, which was not originally designed as a transfer station, as well as G riders transferring at Hoyt–Schermerhorn Streets, some of whom had already transferred from the L. G train riders could also transfer to the E and ​M trains or the 7 and <7>​ trains at Court Square–23rd Street. As the 7 and <7>​ trains would reach capacity during rush hours, some riders already on that route would probably transfer to the N and ​W trains at Queensboro Plaza, one stop east of Court Square. The E and ​M trains would also reach capacity during rush hours, bringing cascading effects to E, ​F, ​M, and ​R riders further east in Queens. One Voice writer concluded that "If you do not take the J, M, Z, A, C, 7, F, G, E, M, or R lines, then I have some good news: You're probably, probably not screwed during the L train shutdown. Except — you had to know there would be exceptions — for those of you who take the 3 and the N/W." In total, fourteen services would be affected by the shutdown. In October 2018, the mitigation plans were described by a Curbed NY writer as inadequate, because of the lack of nearby subway routes that go directly to Manhattan; the lack of passenger capacity at key transfer stations; and the fact that nearly a quarter-million riders use the L train every day. The Curbed writer stated that one service disruption on the J, M, and Z​ trains would have a ripple effect on displaced Canarsie Tube riders. In December 2018, four months before the planned closure of the 14th Street Tunnel, New York governor Andrew Cuomo announced that he would personally visit the tunnel with several transportation experts that month. Cuomo said that he wanted to determine if the closure time could be reduced even further. By this point, the mitigation plans were being finalized. Work on painting road markings, including a busway on 14th Street, was underway. On January 3, 2019, following the tunnel tour, Cuomo announced at a news conference that the tunnels would not completely shut down, contingent on the MTA board approving an alternate plan. Instead, work would occur on weekends and nights, and construction could be finished in 15 to 20 months. This would be accomplished by hanging wires onto the sides of the tunnels and repairing the benchwalls, similar to what was used in the subway systems of Hong Kong, London, and Riyadh,:8 rather than replacing the benchwalls as was originally planned. A similar plan had been considered in 2014, but rejected due to the extent of silica exposure that this option entailed, and another report in 2015 had concluded that a weekend-only shutdown might be unsafe. The announcement occurred after Cuomo consulted with experts from Columbia University and Cornell University, and he reportedly also contacted Tesla, Inc.. The MTA board was not given advance notice of the announcement, and Cuomo only told the MTA to convene an emergency meeting after the announcement had been made. The announcement was criticized by transit advocates who said that a full closure would allow construction to be completed at once, similar to in the Montague Street Tunnel, as opposed to a piecemeal closure, which could take years. Cuomo was also criticized for taking so long to come up with the partial shutdown plan. Many Brooklyn residents and business owners along the route had already moved as a result of the proposed closure, and some North Brooklyn landlords reportedly regretted having signed leases for lower prices. However, the announcement was praised by the shutdown's opponents, which had previously filed a lawsuit over the proposed shutdown. Landlords and brokers also viewed the change in plans favorably. Following the conference, New York City Transit Authority head Andy Byford stated that the Williamsburg Bridge's HOV lanes and the shuttle ferry were no longer needed. The contract with Judlau would also have to be renegotiated and put before the board for a vote, as the contractor had already started the process of procuring materials for a full shutdown. However, the MTA's website indicated that many of the mitigation measures, including station improvements, accessibility renovations, and L train frequency enhancements, would continue. After the conference, Cuomo also stated that he wanted to "blow up" the MTA and restructure its entire operating hierarchy because the agency was inefficient. A special board meeting about the shutdown was held on January 15, 2019. At the board meeting, the modified plan was approved, despite objections from some members. The following month, the MTA decided that several of the previously announced mitigation measures would not be needed. For instance, the Williamsburg Bridge HOV restrictions and the 14th Street busway would not be implemented. In addition, the G would not receive full-length trains, though it would still see an increase in train frequencies during nights and weekends. However, the station improvements would still proceed, and the partial shutdown would begin on April 27, 2019, as previously confirmed. Due to crowding concerns the MTA considered making the First and Third Avenues stations exit-only during weekends. Under the new plan, the free out-of-system transfers would be kept, except for between 21st Street and Hunters Point Avenue in Queens, and would only be instituted during weekends and late nights. Instead of running five shuttle bus routes in Manhattan and Brooklyn at all times, two "Williamsburg Link" shuttle buses, B92 clockwise and B91 counterclockwise, would run during weekends and late nights only. M14A bus service in Manhattan would be increased during weekends. In the months prior to the proposed closure, the MTA suspended L service between Broadway Junction and Eighth Avenue during the weekends in preparation for the partial shutdown. Instead, it operated three shuttle bus routes and expanded M train and M14A bus service. The first construction work related to the 14th Street Tunnel shutdown began in 2017. Workers excavated shafts at the First Avenue and Bedford Avenue stations so equipment could be lowered into the tubes. After the repairs are completed, these shafts are to be converted into additional entrances for those stations. The construction of shafts at the First Avenue station began in July 2017 at the intersection of 14th Street and Avenue A. Shafts were also built at Driggs Avenue and North 5th Street in Brooklyn, at the Bedford Avenue station. The Bedford Avenue station's mezzanine would be expanded to make way for the new entrances. As of July 2018[update], the projects at First Avenue and at Bedford Avenue were about one-fifth complete. :14 Starting in August 2018, the MTA would close the tunnels for 15 weekends in preparation for the full-time closure the following year. In the original plan, there were to be three groups of 150 contractors, with each group working 8-hour shifts. The demolition and replacement of the tunnels' wire duct banks, or benchwalls, were to take up much the project's duration. A dust collection machine, which was custom-ordered for the 14th Street Tunnel project, was to include ventilation and dust filtration systems that allow dust to be contained within the tunnels. The dust was to be taken out of the tunnels via flatbed cars that travel to the shafts at Avenue A in Manhattan and Driggs Avenue in Brooklyn. The demolition was to be completed within three months, after which work on the new station entrances and replacement duct banks would commence. The tracks within the tunnels were also be replaced. These repairs would be able to last up to eighty years. Following the January 2019 announcement that the shutdown would instead be a partial closure, Cuomo and the MTA board unveiled some new details about the project. Rather than completely replacing the benchwall, workers would install new cable ducts on the sides of the existing tunnel walls, and the existing ducts would be abandoned. :7 The technique of racking the cables on the wall differed from previous proposals, in that a rack, rather than the cables themselves, would be bolted onto the wall. :9 The benchwalls would be repaired with epoxy and fiberglass as necessary, then converted into emergency egress walkways. :7, 11 By using this approach, less silica would need to be extracted from the tunnels because the benchwalls would not be entirely demolished. :12 Fiber-optic and lidar sensors would be installed to allow MTA workers to more easily track imminent failures in the benchwalls. Station and track improvements would continue under the revised proposal. :21 The repairs could last for up to forty years, and work might be elongated due to the need to maintain weekday service. After the shutdown was announced in 2016, some Williamsburg residents let their leases expire in 2018. As a result, housing prices began to decrease. The rate of housing vacancies in August 2018 was 25% more than the rate twelve months prior. An independently made documentary, being produced by Ian Mayer and Emmett Adler and titled "End of the Line", is being made about the effects of the 14th Street Tunnel shutdown. A board game, released in January 2019, also satirizes the shutdown. ^ "mta.info | Superstorm Sandy: One Year Later". web.mta.info. Metropolitan Transportation Authority. Archived from the original on August 3, 2016. Retrieved July 23, 2016. ^ "Celebrate Opening of Subway Link". The New York Times. July 1, 1924. Retrieved February 13, 2010. ^ a b c Surico, John (June 29, 2018). "What's Actually Wrong with the L Train Tunnel?". Vice. Retrieved July 1, 2018. ^ a b c Fitzsimmons, Emma G. (May 5, 2016). "Shutdown or Less Service? M.T.A. Weighs 2 Options for L Train Project". The New York Times. ISSN 0362-4331. Retrieved May 7, 2016. ^ a b c "Capital Program Oversight Committee Meeting" (PDF). Metropolitan Transportation Authority. July 23, 2018. pp. 12–21. Retrieved July 23, 2018. ^ a b Warerkar, Tanay (May 6, 2016). "MTA Reveals Details on L Train Shutdown at First Public Meeting". Curbed NY. Retrieved May 7, 2016. ^ a b Fitzsimmons, Emma G. (April 3, 2017). "M.T.A. Shortens L Train Shutdown to 15 Months". The New York Times. ISSN 0362-4331. Retrieved April 4, 2017. ^ a b "MTA | news | Decision to Completely Close the Tunnel Follows Months of Community Meetings, Stakeholder and Public Input on Reconstruction Options; MTA Will Develop and Announce Service Plans as 2019 Project Approaches". www.mta.info. Retrieved July 26, 2016. ^ "Everything you need to know about the L train". am New York. February 21, 2016. Retrieved October 27, 2018. ^ Fitzsimmons, Emma G. (May 5, 2016). "L Train Riders Quiz Transit Officials on Shutdown". The New York Times. Retrieved May 7, 2016. ^ a b c d New York City Transit Authority (July 2018). "MTA New York City Transit Canarsie Tunnel Project Supplemental Environmental Assessment and Section 4(f) Review: Appendices" (PDF). mta.info. Metropolitan Transportation Authority. Retrieved July 27, 2018. ^ a b c d Fitzsimmons, Emma G. (July 25, 2016). "L Train Will Shut Down From Manhattan to Brooklyn in '19 for 18 Months". The New York Times. ISSN 0362-4331. Retrieved July 26, 2016. ^ Barone, Vincent (May 24, 2016). "Survey: L train riders prefer 18-month full shutdown". amny.com. AM New York. Retrieved July 26, 2016. ^ a b "The L Train Shutdown: Here's How to Commute Between Brooklyn and Manhattan". DNAinfo New York. Archived from the original on August 21, 2016. Retrieved July 26, 2016. ^ a b Furfaro, Danielle; Gould, Jennifer (July 25, 2016). "2019 is the year Williamsburg dies". New York Post. Retrieved July 26, 2016. ^ a b c d e f g h "(L) Tunnel Reconstruction" (PDF). Metropolitan Transportation Authority. July 2018. pp. 14–19. Retrieved July 29, 2018. ^ "Capital Program Oversight Committee Meeting" (PDF). mta.info. Metropolitan Transportation Authorityaccessdate=September 15, 2017. July 2017. ^ "Capital Program Oversight Committee Meeting" (PDF). mta.info. Metropolitan Transportation Authority. April 2017. p. 62. Retrieved April 24, 2017. ^ Barone, Vin (October 24, 2017). "Platform door pilot heads to L train station". am New York. Retrieved October 25, 2017. ^ Furfaro, Danielle (October 25, 2017). "MTA to test barrier to stop people from falling on tracks". New York Post. Retrieved October 25, 2017. ^ a b c d e f g h i j k New York City Transit Authority (July 2018). "MTA New York City Transit Canarsie Tunnel Project Supplemental Environmental Assessment and Section 4(f) Review: Final Report" (PDF). mta.info. Metropolitan Transportation Authority. Retrieved July 27, 2018. ^ a b c Rivoli, Dan (May 7, 2016). "Looming L train shutdown forces riders to consider future". NY Daily News. Retrieved May 9, 2016. ^ Kabak, Benjamin (October 24, 2017). "Planning docs show a HOV3 approach to mitigating the L train shutdown". Second Ave. Sagas. Retrieved November 2, 2017. ^ Wolfe, Jonathan (December 14, 2017). "New York Today: The Plan for the L Train Shutdown". The New York Times. ISSN 0362-4331. Retrieved December 16, 2017. ^ "L train shutdown to close portion of 14th Street to cars during rush hour: MTA". New York's PIX11 / WPIX-TV. December 13, 2017. Retrieved December 15, 2017. ^ Walker, Ameena (December 13, 2017). "Long-awaited L train shutdown plan finally released". Curbed NY. Retrieved December 15, 2017. ^ Nir, Sarah Maslin (December 13, 2017). "Rerouting Thousands: City Plans for L Train Closure". The New York Times. ISSN 0362-4331. Retrieved December 16, 2017. ^ Barone, Vincent (January 16, 2018). "Shuttered subway entrances to reopen during L train shutdown". am New York. Retrieved January 17, 2018. ^ Berger, Paul (December 14, 2017). "New York City Council Grills MTA Over Looming Closure of L Subway Line". Retrieved December 15, 2017. ^ "City Council Committee Holds Hearing On L Train Disruptions". CBS Local. December 14, 2017. Retrieved December 15, 2017. ^ Nir, Sarah Maslin (April 3, 2018). "With L Train Shutdown a Year Off, Lower Manhattan Braces for Upheaval". The New York Times. Retrieved April 14, 2018. ^ "Elevators are a win, but L-train shutdown fight still on track". The Villager Newspaper. June 21, 2018. Retrieved June 26, 2018. ^ "L train shutdown prompts 17-hour-a-day 14th St. busway". am New York. June 25, 2018. Retrieved June 26, 2018. ^ "4 'L-Alternative' bus routes detailed at City Council hearing". am New York. June 27, 2018. Retrieved June 28, 2018. ^ "This 'luxury' alternative will make the L train shutdown feel like a dream". New York Post. July 26, 2018. Retrieved July 28, 2018. ^ "Transit & Bus Committee Meeting" (PDF). Metropolitan Transportation Authority. July 23, 2018. pp. 201–205. Retrieved July 23, 2018. ^ "City launching M14 SBS bus ahead of L train shutdown". Metro US. July 24, 2018. Retrieved July 25, 2018. ^ "MTA sets rollout date for L train shutdown busway". am New York. July 23, 2018. Retrieved July 25, 2018. ^ a b "Transit and Bus Committee Meeting - September 2018" (PDF). mta.info. Metropolitan Transportation Authority. September 24, 2018. Retrieved September 23, 2018. ^ "Water surprise! New ferry service will offer free bus transfers during L-train shutdown". Brooklyn Paper. February 23, 2018. Retrieved August 3, 2018. ^ "MTA to Bring Additional Temporary Bus Route, Fully ADA Compliant Subway Station to Canarsie". MTA.info. September 12, 2018. Retrieved October 4, 2018. ^ "Transit & Bus Committee Meeting October 2018" (PDF). mta.info. Metropolitan Transportation Authority. October 22, 2018. p. 193. Retrieved October 24, 2018. ^ "L Train Shutdown to Begin on April 27". Spectrum News NY1 | New York City. October 30, 2018. Retrieved October 31, 2018. ^ "Mark your calendars: L train shutdown begins April 27". am New York. October 30, 2018. Retrieved October 31, 2018. ^ Plitt, Amy (October 30, 2018). "The L train shutdown finally has a start date". Curbed NY. Retrieved October 31, 2018. ^ The Voice Archives (April 20, 2018). "How Screwed Will Your Subway Line Be During the L Train Shutdown? J/M/Z Edition". Village Voice. Retrieved October 13, 2018. ^ The Voice Archives (May 10, 2018). "How Screwed Will Your Subway Line Be by the L Train Shutdown? F/G Edition". Village Voice. Retrieved October 13, 2018. ^ The Voice Archives (April 26, 2018). "How Screwed Will Your Subway Line Be by the L Train Shutdown? A/C Edition". Village Voice. Retrieved October 13, 2018. ^ The Voice Archives (May 3, 2018). "How Screwed Will Your Subway Line Be by the L Train Shutdown? The 7 Edition". Village Voice. Retrieved October 13, 2018. ^ The Voice Archives (May 24, 2018). "How Screwed Will Your Subway Line Be by the L Train Shutdown? E/F/M/R Edition". Village Voice. Retrieved October 13, 2018. ^ The Voice Archives (May 31, 2018). "How Screwed Will Your Subway Line Be by the L Train Shutdown? Everybody Else Edition". Village Voice. Retrieved October 13, 2018. ^ Gordon, Aaron (October 3, 2018). "Is the NYC subway ready for the L train shutdown?". Curbed NY. Retrieved October 13, 2018. ^ Rivoli, Dan; Lovett, Kenneth (December 10, 2018). "Cuomo to visit L train tunnel to see if 15-month shutdown can be shortened". New York Daily News. Retrieved December 11, 2018. ^ "Cuomo vows to 'personally' vet L train plans". am New York. December 10, 2018. Retrieved December 11, 2018. ^ "14th Street prepares for L shutdown". Crain's New York Business. December 17, 2018. Retrieved January 5, 2019. ^ a b c d Berger, Paul (January 3, 2019). "Cuomo Cancels Full L-Train Shutdown in New York City". Wall Street Journal. Retrieved January 4, 2019. ^ a b c d e Fitzsimmons, Emma G.; Goldmacher, Shane (January 3, 2019). "Full Shutdown of L Train to Be Halted by Cuomo". The New York Times. ISSN 0362-4331. Retrieved January 3, 2019. ^ a b Siff, Andrew (January 3, 2019). "'No L-pocalypse': New Plan Avoids Dreaded Subway Shutdown". NBC New York. Retrieved January 4, 2019. ^ "Cuomo Cancels Full L Train Shutdown in Favor of Part-Time Closures". Commercial Observer. January 3, 2019. Retrieved January 4, 2019. ^ Fink, Zack (January 5, 2019). "Cuomo Appears to Backtrack, Says New L Train Plan Needs MTA Board Approval". Spectrum News NY1 | New York City. Retrieved January 6, 2019. ^ a b c d e f "L Project Update New Design Recommendations Overall Project Update" (PDF). Metropolitan Transportation Authority. January 15, 2019. Retrieved January 18, 2019. ^ a b Hawkins, Andrew J. (January 3, 2019). "New York's plan to avoid the L train shutdown is innovative, high-tech, and untested in the US". The Verge. Retrieved January 4, 2019. ^ a b c Fitzsimmons, Emma G. (January 15, 2019). "N.Y. Today: New Doubts About That Plan to Save the L Train". The New York Times. ISSN 0362-4331. Retrieved January 15, 2019. ^ Surico, John (January 3, 2019). "Well, the L Train Shutdown Isn't Happening Anymore". Vice. Retrieved January 4, 2019. ^ Fitzsimmons, Emma G.; McKinley, Jesse (January 4, 2019). "The L Train Shutdown Plan Was 3 Years in the Making. It Unraveled in 3 Weeks". The New York Times. ISSN 0362-4331. Retrieved January 5, 2019. ^ "MTA Board Member: We Weren't Told About Plan to Halt the L Train Shutdown". NY1. January 4, 2019. Retrieved January 5, 2019. ^ Rivoli, Dan (January 4, 2019). "Cuomo tells MTA board to hold emergency hearing on new L train plan". New York Daily News. Retrieved January 5, 2019. ^ Goldman, Henry (January 3, 2019). "New York City's L Train Won't Shut Down for Work, Cuomo Says". Bloomberg. Retrieved January 4, 2019. ^ "People are slamming New York's governor for taking over 2 years to come up with a plan to avoid shutting down one of NYC's busiest subway lines". SFGate. January 3, 2019. Retrieved January 4, 2019. ^ Kim, Elizabeth (January 11, 2019). "L Train Shutdown Reversal Stings For Small Business Owners Who Gave Up On Williamsburg". Gothamist. Archived from the original on January 11, 2019. Retrieved January 12, 2019. ^ a b "They Upended Their Lives to Avoid the L Train Shutdown. Then There Was No Shutdown". The New York Times. January 4, 2019. Retrieved January 6, 2019. ^ "Opponents 'rail-ly' relieved as L shutdown is shot down". The Villager. January 4, 2019. Retrieved January 5, 2019. ^ "Tenants Scramble for Market Reset After L Train Shutdown Reversal". Commercial Observer. January 10, 2019. Retrieved January 12, 2019. ^ Robbins, Liz (January 3, 2019). "The L Train Shutdown Was Just Canceled. What Exactly Does That Mean?". The New York Times. ISSN 0362-4331. Retrieved January 4, 2019. ^ Robbins, Christopher; Offenhartz, Jake (January 3, 2019). "L'Pocalypse Nah: Cuomo Says Full L Train Shutdown Unnecessary". Gothamist. Archived from the original on January 3, 2019. Retrieved January 5, 2019. ^ Berger, Paul (January 7, 2019). "After Cuomo Swoops In, MTA Officials Face L Train Deadline Hurdles". WSJ. Retrieved January 9, 2019. ^ "L Project". MTA. January 11, 2019. Archived from the original on January 11, 2019. Retrieved January 12, 2019. ^ Berger, Paul (January 8, 2019). "Cuomo's Talk of Tearing Up MTA Timed to Upcoming Budget Season". WSJ. Retrieved January 9, 2019. ^ Lovett, Kenneth; Rivoli, Dan (January 8, 2019). "Cuomo wants to 'blow up' the MTA after L train debacle". New York Daily News. Retrieved January 9, 2019. ^ "Forget everything you knew about the L train shutdown". am New York. January 15, 2019. Retrieved January 19, 2019. ^ a b "For 250,000 Daily Riders on the L Train, Transportation Purgatory". The New York Times. January 18, 2019. Retrieved January 19, 2019. ^ "'L' Train Service May Still be Reduced on Nights and Weekends for Repairs". Spectrum News NY1 | New York City. February 14, 2019. Retrieved February 14, 2019. ^ Siff, Andrew (February 13, 2019). "MTA Unveils Proposed Alternative Service Plan for L Train". NBC New York. Retrieved February 14, 2019. ^ "Planned Service Changes During the L project". MTA. Retrieved March 15, 2019. ^ "L Service Changes: January to April 2019". MTA. Retrieved February 14, 2019. ^ Hobbs, Allegra (July 11, 2017). "MTA Begins Work on New L Train Entrance at Avenue A as Bus Stops Relocate". DNAinfo New York. Archived from the original on September 1, 2017. Retrieved August 31, 2017. ^ "Project Description, Budget and Scope: ADA Accessibility at 1st Avenue Station on the Canarsie Line". Metropolitan Transportation Authority. March 31, 2018. Retrieved June 5, 2018. ^ "Project Description, Budget and Scope: ADA Accessibility at Bedford Avenue Station on the Canarsie Line". Metropolitan Transportation Authority. March 31, 2018. Retrieved June 5, 2018. ^ a b "Hipsters flee Williamsburg as L train shutdown approaches". New York Post. August 9, 2018. Retrieved August 10, 2018. ^ Surico, John (July 25, 2018). "The L Train Shutdown Is Getting Its Own Documentary". Vice. Retrieved July 28, 2018. ^ "On the L train doc set, it's all about the 'money train'". am New York. June 19, 2018. Retrieved July 28, 2018. "Arriving in 2019". End of the Line. Retrieved November 1, 2018. ^ "Laugh off the (partial) L train shutdown with this board game". am New York. January 3, 2019. Retrieved January 4, 2019. This page was last edited on 17 April 2019, at 19:09 (UTC).